Hi everyone! I am excited to be back with another 4 For Fashion post today. If you missed my first post with these lovely ladies, you can read it here. 4 For Fashion is a group of 4 bloggers (including yours truly) who all believe that you can find something that fits your personal style just about anywhere. Our ages range from 20s to 50s and our goal is to provide fashion inspiration to ladies of all ages. Today we have teamed up with a premium denim boutique in Charlotte NC called Blue Hem. Blue Hem has a great selection of denim for both men and women in all colors, fits and styles. The four of us all went in to the store at a different time to select our jeans, and I love that we all selected such different styles that match our personal taste. I selected a cropped pair of jeans by Joe's Jeans that are a lighter wash with distressing at the knees. These jeans have just the right amount of stretch and are so comfortable. I think that you can easily dress any pair of jeans up or down and I chose a dressier look to show here. I paired the jeans with a classic white top with some ruffle detailing. I wanted to add some fun accents to the outfit, so I chose a tassel necklace and some leopard sandals to finish the look. You could also wear these jeans with a t-shirt and sneakers for a more casual look. This is Barbi Brooks with Southern Blonde Chic. She chose a great basic jean by 3x1 with a wide cuff. This dark wash goes with anything and these jeans fit Barbi so well. I love the white blouse that she paired with the jeans and think the turquoise jewelry adds the perfect amount of color. This is LauRen Merola with All of the F-Words. Super distressed jeans are so on trend right now, and I love the pair that she chose by Mcguire. Because the jeans make a statement on their own, I think that LauRen's simple tee and jewelry are the perfect pieces to wear with this pair of denim. Last but not least, this is Rachel Brown with Queen City Chic. Rachel opted for a pair of denim shorts by James Jeans and this pair is too cute. So many denim shorts are super short and I love that these have a slightly longer inseam. The high waist style looks great on Rachel and is very popular right now. 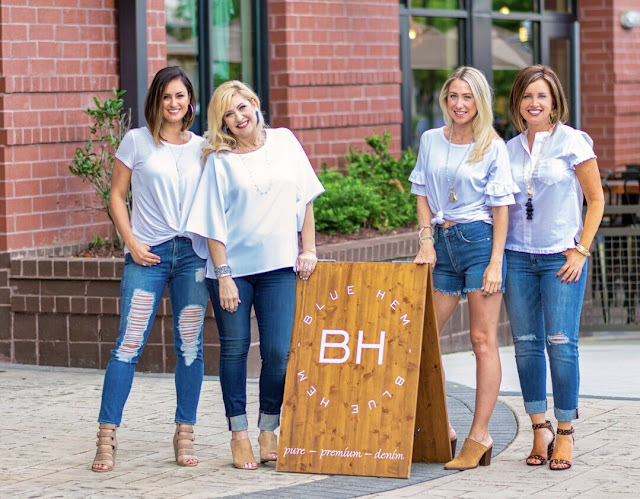 You can find all of the denim we are wearing at Blue Hem. Blue Hem is located in the Southend area of Charlotte at 1750 Camden Road. For those of you who are not local, you can shop online here. You can find them on Facebook here, Instagram here and reach them by phone at (980) 228-1868. If you stop by the store, be sure to tell them that the ladies of 4 For Fashion sent you! Stay tuned for another edition of "4 For Fashion" coming soon. If there is a particular style or shop you would like to see featured in this series, please comment below or send me an email. Thank you so much for stopping Smart Southern Style. I appreciate you all!